The Shoal Site is situated on 2,560 acres of withdrawn federal lands located within the north-central portion of the Sand Springs Range in Churchill County, Nevada. The town of Fallon is the largest populated area in the region and is about 30 miles northwest of the site. The region around the Shoal Site is sparsely populated; military installations, recreation, ranching, and mining provide the dominant commercial interests. 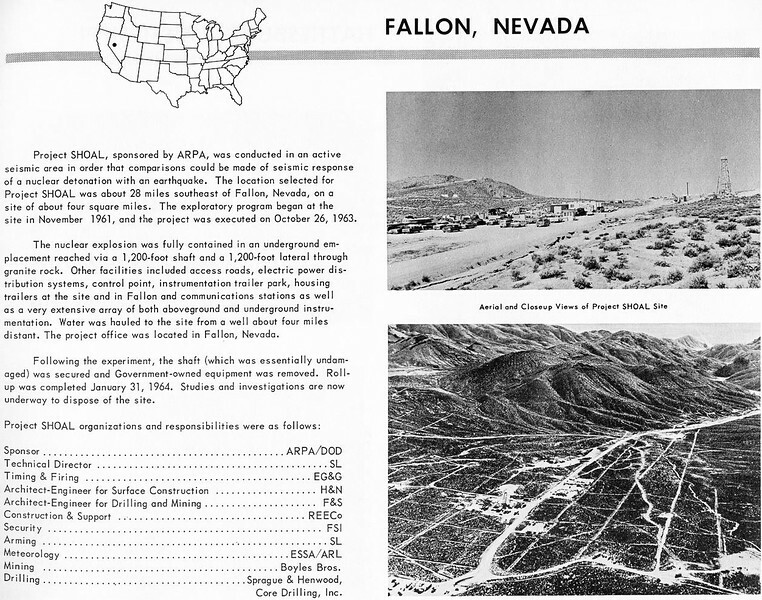 The Project Shoal underground nuclear test was part of the Vela Uniform program sponsored jointly by the U.S Department of Defense and U.S. Atomic Energy Commission (AEC), a predecessor agency of the U.S. Department of Energy (DOE). Vela Uniform was a research and development program directed toward locating, detecting and identifying underground detonations. The objective of Project Shoal was to detonate a nuclear device underground in an active seismic area to improve the United States' ability to detect, identify and locate underground nuclear detonations. The Project Shoal test was performed on Oct. 26, 1963. The test consisted of detonating a 12-kiloton nuclear device in granitic rock at a depth of approximately 1,211 feet below ground surface. Emplacement of the device was accomplished through a shaft located approximately 1,000 feet west of surface ground zero (SGZ). The shaft was mined to a depth of approximately 1,315 feet below ground surface. At that depth, a drift (a nearly horizontal tunnel) was mined approximately 300 feet west and 1,050 feet east, ending in a 30-foot vertical “buttonhook” where the nuclear device was emplaced. Re-entry drilling directly over the detonation cavity indicated that the Shoal device detonated as predicted, and a rubble chimney about 171 feet in diameter and about 356 feet high was formed above the shot point from the explosion. No radiation escaped to the surface during the underground nuclear test, and no further underground nuclear testing was conducted at the site.